I did it! From last Sunday to this Monday, I didn’t eat processed sugar and wanted to report back on how it went. A 7 day sugar detox isn’t long compared to programs like “Whole 30” where participants go, you guessed it, 30 days without eating processed foods. But taking a week off from sugar was a more manageable goal for me, and it went really well! …Dates. I was popping these like candy! It was probably a good thing, too, since I have a Costco-sized 2.5 pound bag hanging out in my dorm room. It might even be down to 2 pounds now, oh boy. …Homemade Larabars. I noticed that I ate a lot more fruits and nuts in general this week, too, which is definitely a good thing. …Bananas with Trader Joe’s salted almond butter. The perfect sweet and salty snack . -Since I was cutting out unnatural sugar but still eating the same amount of calories every day, I definitely ate more nutrient-dense foods rather than “empty” sugar calories, and I felt more energized. -Part of my plan was drinking at least 100 ounces of water per day (filling up my Camelbak 4 times) and I was surprised by how big of a difference it made. I felt hungry a lot less often and never felt thirsty or dehydrated at all. 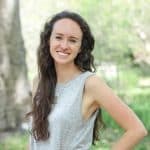 -I viewed food more practically as fuel to give me energy, help my muscles recover after runs, etc., which I think can be healthy to an extent, as long as you don’t take all of the fun out of food. 1. I missed my ritual of eating ice cream in bed every night (that I’m in my dorm). Eating dried fruit in bed just isn’t the same– go figure, huh? 2. I didn’t eat treats when I was with friends, so there were a few times when everyone else was eating something that I wasn’t, but it wasn’t a big deal. Those are actually the only cons that come to mind! I love that I feel less addicted to sugar now. 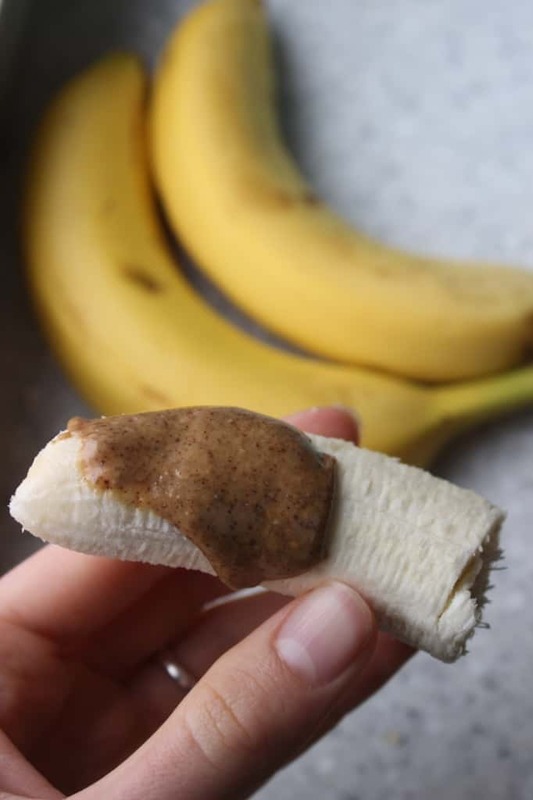 Even though the no-sugar period is over, I actually chose a banana with almond butter over a bowl of ice cream last night! 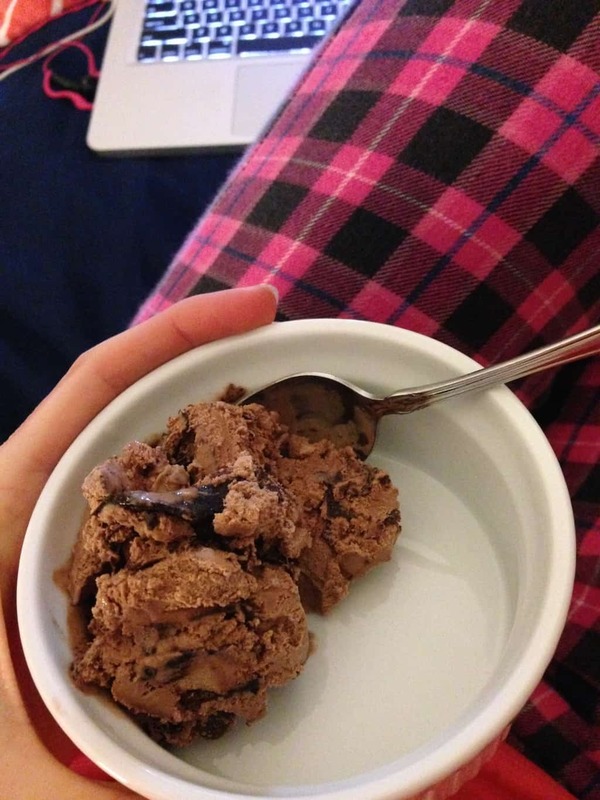 I’ve started craving savory snacks more often, and I think I’ll be okay with having a small bowl of ice cream every few nights now as a special treat instead of every night because I don’t feel like I NEED it anymore. While I don’t plan on jumping on the “clean eating” bandwagon, (no sugar ever, no processed foods ever, etc. ), I want to keep being more mindful of what I’m eating and how much sugar I’m taking in, and I definitely plan to keep drinking 100 ounces of water every day. It’s crazy what just a few small changes can do! -Dates– love ’em or hate ’em? -Do you have a guilty pleasure junk food? -Do you love eating in bed?! 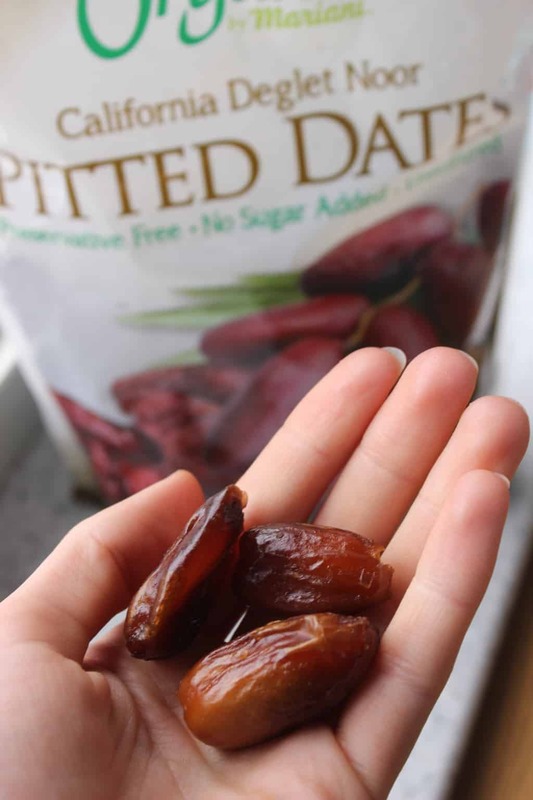 I like dates with nut butter but they’re too sweet for me without it! I love eating in bed…I do it all the time haha. TJ’s almond butter on anything is heavenly! I like dates, but find myself never buying them! They do seem like such a great exchange for something sugar filled though I will have to grab some and try it out! 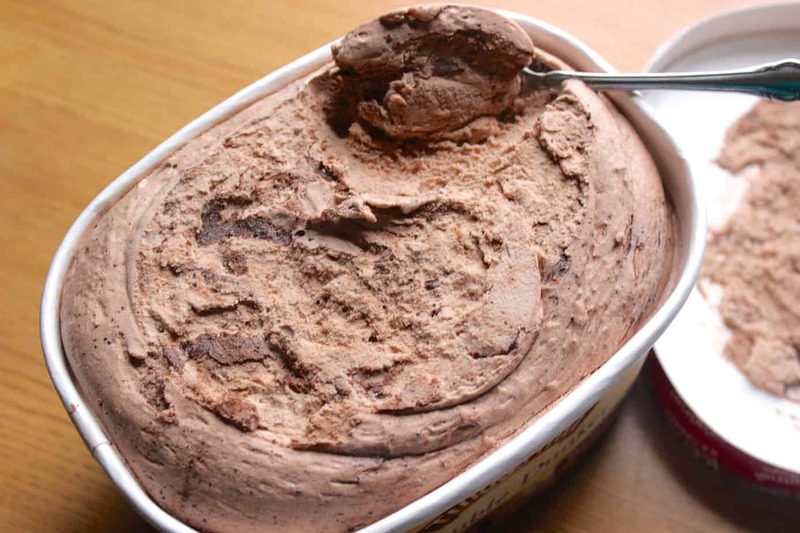 Yay, I’m so glad that you found an ice cream you can still eat! I’ve seen that brand at the grocery store before but haven’t tried it yet! I have not really gotten into eating dates, but I think that’s because I haven’t seen them in a bulk pack like the Costco one you posted. I do think they are perfect to toss into a smoothie if you want to add some sweetness! I’ve never had a plain date before! I need to try one. 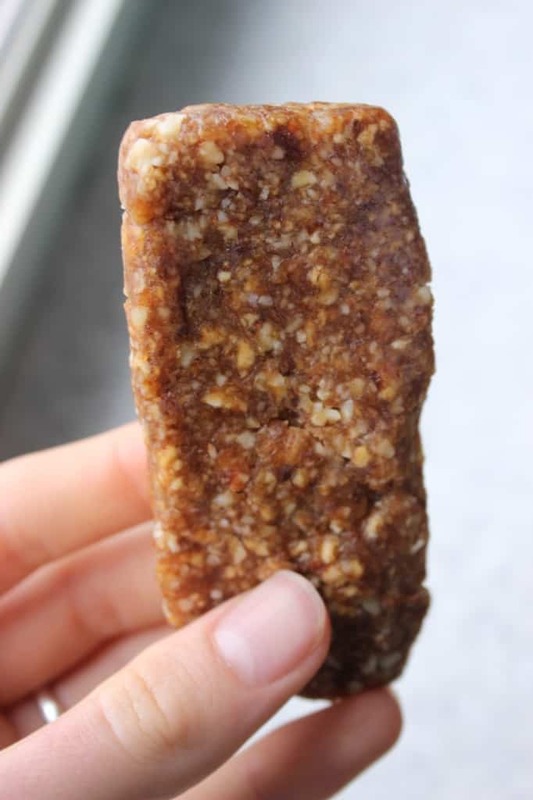 I’ve only ever had them in different types of bars and um wrapped in bacon a few years ago because they had them at Costco like that…talk about healthy ;). Congratulations on making it through your week! I’m glad you were able to come out of it making even healthier choices! I did something similar with artificial sweeteners last year and at first with being a girl whose household grew up on Crytstal Light and diet sodas, it was super hard, but now I definitely don’t crave it as much. Haha love Costco’s samples! Ooh, that does sound tough to give up artificial sweeteners. I’ve never been a big soda person, but I used to work at Chick-fil-A (unlimited diet lemonade, anyone?) and had to restrain myself from drinking it all of the time because it was so good! I had never had a date until last year. I bought a big bag to make an energy ball recipe and ended up with a ton extra… then learned I can’t be trusted with them in the house! LOL. So addictive – just like raisins. If I tried to eat a meal in bed, my OCD husband would probably pass out. Eating on the couch is our equivalent I suppose. Well done! Giving up sugar is SO hard, especially the lack of sugar headaches. Mmm I’ve never tried cashew butter but I love cashews, so I’m sure I’d love it! I’ve never had dates! I think I need to check them out! Great job on the “detox.” I’ve wanted to try something similar, but I know the first couple days would be really challenging! I’ve never actually tried a date, I think in my head I’m worried they’ll taste like fig newtons. I think they mostly taste like giant raisins! I also love fig newtons, but they don’t remind me of those at all 🙂 I think the key to starting a sugar detox for me was starting when I felt sick of sugar, so that way, the first few days were kind of a relief! I meant to comment on your post a week ago, but I think it’s SO cool that you did this! I think I might just have to try it out myself! I don’t have dates very often, but I am obsessed with dried figs. You should try the Bare Apple Chips— they are so delicious dipped in almond butter! And I never eat in bed…I don’t have anything against it, but I can just never think of a time when I have! Eating in bed is actually something I just don’t do. In fact I really only eat at the kitchen table. It hasn’t always been that way. In fact there was a time where I’d eat every meal minus supper on the couch during the day. If I had a kitchen table (or a couch, for that matter), I’d probably eat there, too 🙂 It’s basically either my bed, my desk, or my chair if I’m in my dorm room haha. Congrats! I kind of did a similar thing freshman year… well i cut out sugar at night in particular. so i’d have an apple or tea or something. i definitely noticed a huge decrease in my sugar cravings! It’s hard to cut sugar out, but it definitely works! I’d love to get in the habit of drinking tea at night, but whenever I do, the caffeine makes me less sleepy. Do you drink decaf at night? Hahaha I love that you were eating a date in bed when you read this! Too funny! 😀 And I completely agree with all of your points. Haha true! Chips don’t ever tempt me since I’m not much of a salt person, but with sugar? It’s game ON. Good for you! I am an ice cream fiend too, but I love fruit, and can even taste the natural sweetness in veggies like broccoli when I haven’t had a ton of processed sugars. It’s a difference I notice and enjoy. medjool dates are too sweet for me. i like delget noir! or something like that haha. my family buys the mfrom the indian store. i like dates, but don’t love them, and still manage too easily over eat them haha. but i do LOVE dried fruit, and since i try not to eat too much sugar, it’s my go to when i want something sweet. i LOVE goji berries, flame raisins, mulberries, prunes, oh gosh like all fruit haha. Awesome post! Thanks for the inspiration!! Dates are very sweet. As a diabetic I avoid them. But I’ve always had a sweet tooth and would take more insulin to eat cake during the holidays and even eat candy bars! I learned that your body treats the sugar like a poison, and that concerned me so I decided to cut way back for a while. After a couple of months, my back acne all cleared up! I guess the bacteria love sugar so they up and left once I stopped giving it to them!